Nepenthes hamata Gng. Lumut BE-3380 Big Specimen Plants! 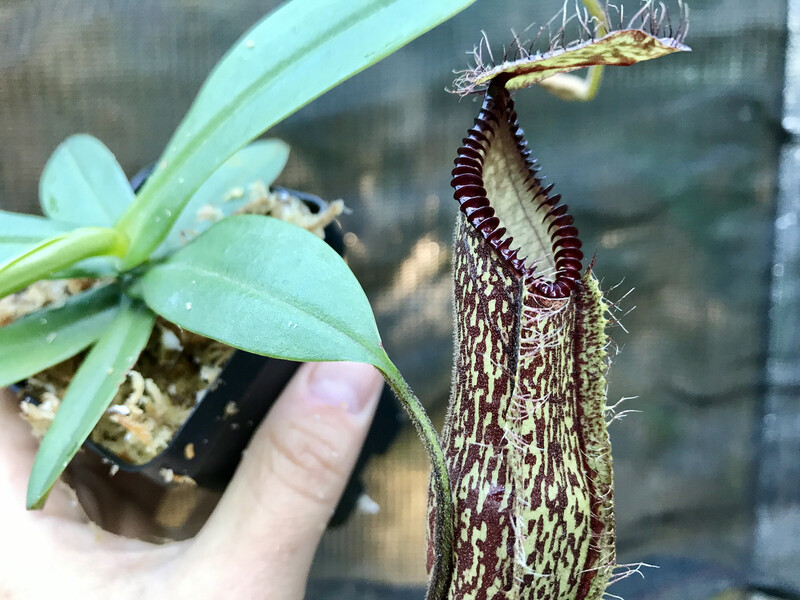 Borneo Exotics Nepenthes hamata are by far the nicest hamata clones in the market when side by side with any other hamata clones. These plants are the biggest ever offered, capable of making pitcher several inches tall. A Borneo Exotics hamata is a jewel in any collection. Plant in the photo is an exact plant for sale but a couple are available so Plant may similar to the plants in photos but may not be the exact plant, exact clone though. Hamata always inevitably lose their pitchers after importing and these plants will likely start making new pitchers again in the next few months. Plant with be shipped with roots wrapped in sphagnum moss wrapped with paper towel, in a sealed bag or container before boxing up. If you have seen my Nepenthes you will know they are healthy and happy. Greenhouse grown, RH 85+, Days 80F, Nights 55F+. Shipping from Canada.